Special 7-4 is the fourth level of Special 7 in Super Mario 3D Land. It is based off of World 2-4. 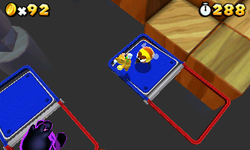 The player starts on a small wooden platform that is next to a Red-Blue Panel. Next to this are some more platforms and Flip-Swap Platforms. After are some Red-Blue Panels which have Spikes on them, the platforms lead to another platform with a rotating Spike, a Flying ? Block and several Brick Blocks on it. The next section contains some more Flip-Swap Platforms that have Spikes on them. Finally, there is a platform that leads to more Red-Blue Panels that lead to the Goal Pole. Star Medal 1: The first Star Medal is on a blue Red-Blue Panel next to some Spikes. Star Medal 2: The second Star Medal is on the platform with the Flying ? Block. Star Medal 3: The third Star Medal is on a blue Red-Blue Panel near the rotating Spikes.